Neptune Lines is a logistics provider for projects and construction equipment industry. Focused on transportation to all Latin American and the Caribbean Countries since 1998. But it also serves through its vast number of partners and agents the rest of the world. Neptune Lines became a pioneer in Panama as the first Logistics product distribution center offering refurbishing, maintenance and a vast list of additional services to construction equipment manufacturers and their dealers, providing strategic positioning for their machinery closer to market, offering a single move directly to their customer’s final location. Over time other clients have noticed the service provided by Neptune Lines and asked for the service to be replicated to their industry segments. Since its beginnings, Neptune Lines’ reinvestment strategy is focused in infrastructure, technology, and professional development, leading to the expansion of their business scope, from break-bulk and construction equipment industries, to others such as the automobile, power generation, steel and aircraft industries. As an integral supply chain and logistics product distribution company, Neptune Lines is known for its quality, reliability, flexibility, innovation, and experience throughout Latin America and the World. As Neptune Lines’ end-to-end supply chain logistics kept growing, more opportunities arose, such as to become the main logistics provider for the expansion of the Panama Canal in 2010 through its completion in 2016. To develop integrated logistics solutions with high added value, creating competitive advantages for our allies, through our specialized staff and commitment to the standards of world-class quality, security, health, and environment. To be the most reliable Global Ally in Tailored and Integral Logistics Solutions, surpassing our Commercial Partners’ expectations, ensuring Flexibility, Reliability, and Speed in the supply chain. 1 Commitment revolves around our customers. 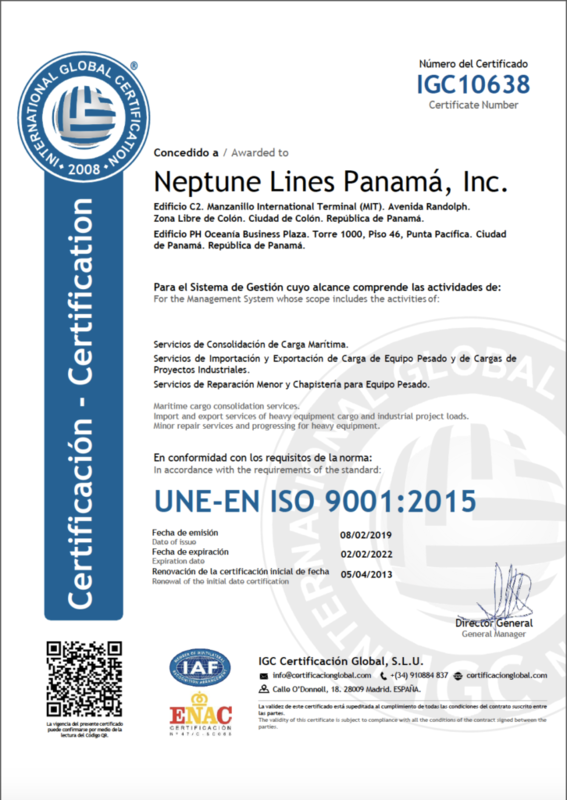 In Neptune Lines, we are committed to give integrated logistic solutions to heavy equipment, general cargo, and any industrial projects, surpassing our client expectations and needs in the National and International Market, executed by our highly qualified personnel committed to an operational excellence, industrial safety and occupational health, continuously improving our processes, with a strong environmental focus.